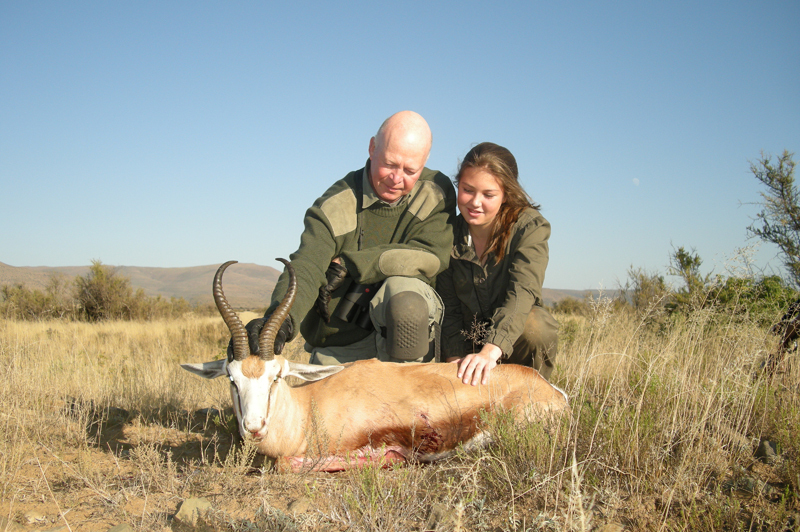 Admiring Steffi’s wonderful springbok with her, unaware that this would be my last hunt on Bankfontein. 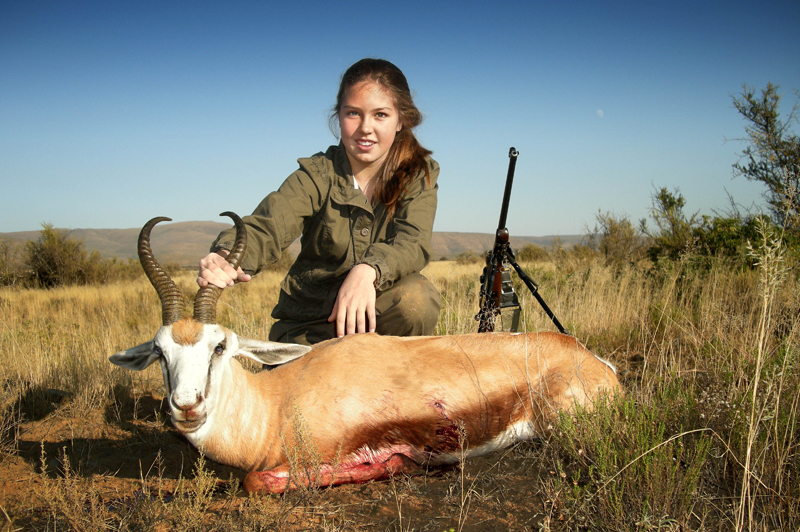 Steffi Pretorius with a wonderful Rowland Ward class springbok, the biggest ever shot on Bankfontein. Steffi sitting alone with her wonderful springbok and her thoughts with the Bankberge in the distance from which the ranch takes its name. I stood in the dining room of our farmhouse, with my arm around the shoulders of my wife as the tears streamed down her face. Our house had been wrecked. Every door had been smashed, every light fitting ripped out of the ceiling. Even the built-in cupboards had been crowbarred out of the walls. We had bought the property from a bankrupt, angora goat farmer days before the bank foreclosed on his mortgage. Like many others, he had been carried away by the mohair boom and, when the price collapsed, so did his fortunes. Feeling desperately sorry for the man, we allowed him to remain on the farm for a year, free of charge, in order to help him find his feet. He repaid us by illegally sub-letting our farm to a man with 3 000 angora goats which decimated what little grazing was left. He cut down the big, shade trees along the river and sold the wood. He shot whatever game he could find and, as a farewell present, vandalised our house. The house was easy to fix. It took only money although we transported over 22 tractor trailer loads of rubbish – rusted iron, broken glass, sodden cardboard, plastic bags and the ubiquitous pieces of orange, plastic string used to tie lucern bales – and buried them in two deep holes I dug with a bulldozer. It took six men a year, however, of daily patrols to clear the 7000 acres of similar rubbish during which time I game fenced the perimeter and eliminated all internal fences and gates. That used up all my capital and the rehabilitation of the eroded land and the re-introduction of the game that had originally occurred along this eastern edge of the Great Karoo in South Africa’s Eastern Cape Province, took much longer. And it is only now, some twenty years later, after years of building stone gabions, repairing dams and water reticulation systems, ploughing, re-seeding, brush packing and careful vegetation and game control that I feel I have made a sustainable dent in the soil erosion. So easy to write about but so hard to do! During all of this time, the beauty, stillness, peace and space of the land and its people slowly but surely embraced and enveloped me and I grew to love it with a blinding passion. And exactly 12 days ago I sold it. Why? Simplistically, and no decision like this is simple, there are three main reasons, the most important of which is that my children, much as they enjoy the ranch, do not share the same passion for the veld as my wife and I and so the ranch was always going to be sold, the only question was when and by whom. Secondly, I have experienced increasing health problems and it is over an hour from the ranch to the nearest hospital. Finally, government is against game ranching and is beginning to make life difficult for us ranchers. While there are moves afoot to change government’s mind, if the past is anything to go by, the harder people try, the more determined government becomes to implement its misguided measures. None of this was present in my mind, however, as I stood behind the slim, 15 year old girl bent over my wife’s 7×57 Brno on the shooting bench at our 300 metre range. I had known her since birth and my mind automatically travelled back nine years to the first occasion on which she had sat on the selfsame bench. She had been an only child at that stage. Precocious and spoilt. A real handful. And she was being all of those things at that moment in time. Her parents, two of the most gifted people I know, had kindly agreed to travelled the 828 kilometres from Johannesburg to Bankfontein in order to film and photograph my hunting trophies for a book and a number of magazine articles and Steffi was doing her level best to frustrate all their endeavours. I don’t know where the idea came from, but I suddenly knelt down in front of her and asked, "Steffi, would you like to learn to shoot?" The little minx looked me up and down in a calculating manner and, eventually, nodded her head and said one word, "Yes." As I unpacked my ancient, 50 year old Brno .22, I could see I held her undivided attention. Her pale, sea blue eyes were focused intently on the rifle as I screwed the silencer onto the barrel and loaded the cartridges into the magazine. I did not talk down to her but, as usual, with each person I teach to shoot, took her carefully through the constituent parts of the rifle and the cartridges, explained how they worked as well as the safety rules of the range. When I started to repeat my instructions to make sure she understood, she interrupted me with an impatient, "Yes, yes, I know all that. What’s next?" To my amazement, when I quizzed her on what we had just covered, she was able to answer every question accurately. I was gob smacked but did my best to hide my surprise. She was six, for heaven’s sake! I was even more amazed by what subsequently occurred. Her first five shots with subsonic rounds at 25 metres all cut one another just below the bull and could easily have been covered by one of my fingernails. This time, I could not contain myself and praised her because, quite simply, they were the best first five shots that I had ever seen a young first timer make and I suspected that, for the first time in my life, I might be dealing with a natural shot. She metamorphosised before my eyes. The little brat was transformed into a totally focused, young person intent on inhaling as much knowledge as humanly possible in the shortest possible time about firearms, ammunition and shooting. Suffice it to say, that my moment of inspiration revolutionized our weekend and Steffi’s joy was complete when, later, her father was unable to match her shooting prowess. When they left for Johannesburg, Steffi took with her some of her targets, empty cartridge cases, an impala skin and a leopard skull mounted on a wooden plaque for Monday morning’s, "Show and Tell" at school. I gathered afterwards that she was the star turn. The years flew by. Twin girls expanded the size of her family and I watched Steffi grow into a kind, helpful, talented, determined, disciplined and composed young woman. If this sounds as if I had become a fan, you are absolutely correct. Having said that, months and even years would pass with very little contact. My business career absorbed me and, when I wasn’t working, I was hunting and consumed by my own family. To compound matters, six years ago, Jane and I moved back to my boyhood home, Cape Town. Her dad, Theo, and I remained much closer however. He filmed my hunts in Ethiopia and Cameroon and then, together, we produced the three hour long, Flack Hunts South Africa documentary. Last year, I again needed professional photographs taken on Bankfontein for a new book, Hunting Icons of Africa, which was launched in November, 2009 and, to the surprise of both of us, Steffi asked if she could come along. During her visit I taught her to hunt and, at the end of the week long course, she shot her first game animal, a good, representative Kafue lechwe. 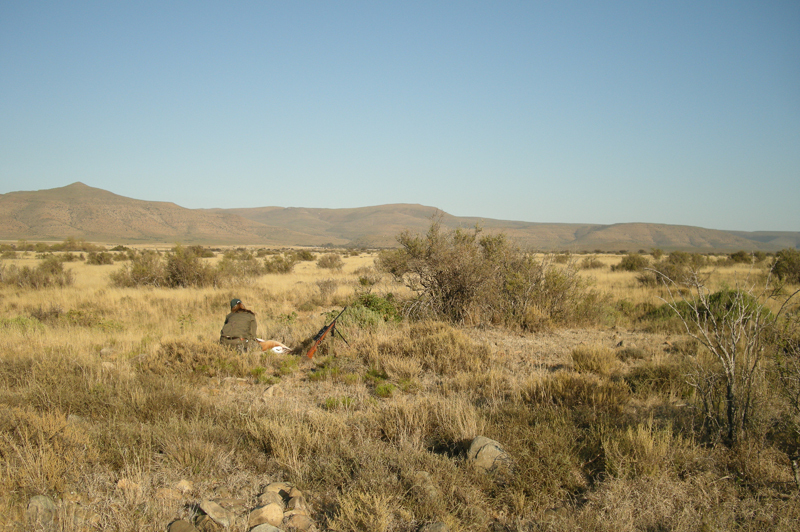 Another year passed and Theo called to say that Steffi was agitating to return to the Karoo. What were the chances of them being able to visit during her July school vacation? What a pleasure! When they arrived, I took Steffi through a refresher course and was delighted to see that her shooting skills were as good as always. Bankfontein is blessed with three different types of habitat – plains, riverine, hills and mountains – which are home to a broad spectrum of game species, in our case, 22 in all. Steffi thought that a springbok ram, would look perfect on her wall above the shoulder mounted lechwe. Of course, the mass springbok migrations containing hundreds of thousands of animals are a thing of the past but antidorcas marsupialis is still a Karoo icon. Although looking and behaving like a gazelle, it is not classified as one and the word marsupialis comes from the Latin, marsupium or pouch, and refers to the way the white fan of hair on its back is hidden in a pouch of brown. These hairs are extended when it stots – a kind of stiff legged, pogo stick jumping – and when it dies, when the fan exudes a gentle, sweet, honey-like scent. There is something special about sitting in Bankfontein’s farm kitchen dunking homemade rusks in strong, sweet tea prior to a hunt. Excitement and apprehension lie just beneath the surface. The house is quiet and dark. Expectant. Only the cones of yellow light from the kitchen windows illuminate anything outside. It’s as if you are the only people awake in the world. It’s freezing outside and there is a reluctance to leave this warm, safe cocoon but an eagerness to begin. Steffi and I don’t say much, each busy with his or her thoughts. Mine are focused on where it might be best to go this morning given the breeze and sun direction. Eventually, we shrug into our jackets, hats, scarves and gloves and brave the crisp, cold, clear Karoo winter’s air. 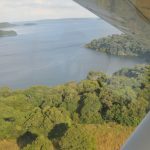 Alfie, our foreman and Charles, one of his assistants, are already waiting in the dark next to my hunting vehicle, a 4×4 Toyota Hilux Double Cab but, before we climb in and head out, I discuss my plans with Alfie. We dicker backwards and forwards and, finally, decide to drive through a gap in the mountains, leave the vehicle next to the dam at the exit of the gap and hunt along the foothills and edge of the plains looking for one of the trophy quality springbok rams that stake out this prime territory. As we climb the dam wall, we are almost immediately rewarded by a flash of white through the Karee bushes up ahead and, resorting to one of my favourite tactics, we immediately duck down into the bed of the river feeding the dam. Only the soft crunch of hiking boot sole on river bed soil breaks the greying stillness of early dawn. I miscalculate the position of the springbok herd and, when I ease my head over the square lip of the bare, pale beige, sandy riverbank, I see the eyes of the closest springbok – no more than 15 paces away – bulge and her half snort, half shriek of surprise is expelled from her nostrils in a stream of condensed air. She goes from nought to a hundred in three nano seconds, jinks past a shrub and hares off, pulling the rest of the herd away with her out onto the open plains. Far to the north west, in the direction of the flat, bench-like mountains, the Bankberge, from which the ranch partially takes its name, Alfie spots another small herd of springbok and off we go, line astern. Always keeping one of the Karee bushes on the edge of the plains between us and them, only moving when the heads of the springbok are down and feeding, we gradually close in. At about 500 metres I sit and plot the position of each of the five rams. One is an absolute monster and will easily beat Rowland Ward’s minimum standard of 14 ½ inches. I use the length of the springbok’s ears – six to seven inches long – as a guide. The horns of the big ram grow straight up from the skull for an inch or so before belling out and then, importantly, at the top of the bell, curve backwards for another inch or so. This is what makes the difference and, as we ultimately find out, provides the 15 ¼ inch length. By now, I am the most excited member of the hunting party and am determined not to botch the stalk. I leave Alfie and Charles behind, take the rifle from Steffi, sling it diagonally under my torso, barrel forward, and start to crawl. It takes a long time to cover 500 metres crawling and slithering. My gloves and knee pads help but, towards the end, I am huffing like an old puffing billy in a western movie. We sit in the shadow of a small shrub and try to blend in with its shape. Steffi is tight against my left side so she can lean against my shoulder to steady herself as we have practiced. She is ensconced behind the Harris bipod attached to the reinforced front sling swivel of the 7×57 and totally focused on the sight picture through the old, 4x Bushnell scope. The rams are blissfully unaware of our presence about 120 metres away but they won’t keep still. "OK, Steffi, there he is. The one with his head down moving to the left. No, no, wait. There’s another behind. OK, are you on him. No, wait, he is moving again." And so it continues. Eventually the small batchelor herd feeds further and further away and we have to move. We are now in trouble as we can no longer plan our stalk according to the cover but have to travel across a 50 metre wide, bare patch. This time we "hoover" on our rear ends, me with the rifle across my lap. Each time a springbok starts to lift its head we freeze. I can’t believe they haven’t seen us! We must stick out like the proverbial dog’s family jewels. Again Steffi aims and aims some more. I put a little pressure on her. I can’t help myself. This is one of, if not the, biggest springbok I have ever seen on Bankfontein. "When he next stops and I say it’s good to shoot, you should really consider taking the shot. They’re not going to think we’re a bush forever," I whisper. She ignores me. After all her training, she knows she is the only one who can make this decision. So should I. After all, it’s me that has drummed the lesson into her. "Do not pull the trigger until you are certain of the shot." Out of nowhere, a shot rings out. The ram levitates and, for a few nano seconds, the bush is alive with beige, white and brown bodies pogo-sticking through the air and out of sight. I ignore the distractions, lock onto the ram and trail it with my eyes. "Feel good?" I ask as I look down at Steffi. "Mmmmeh" she confirms with a nod. That’s good enough for me. "OK, let’s go and find your buck." I take the rifle from her as she stands. I know there is a round in the chamber because that’s how she has been taught but I check any way. I see her look at me from under her eyebrows with a look which says, "Do you really think that’s necessary?" and feel compelled to say, "Just checking". Side by side we move carefully forward and I turn around to see where Alfie and Charles are. They are safely behind us and I move to the spot where the ram had been grazing – always my starting point – and, in the direction of its jet propelled departure, soon find splashes of bright red, heart blood. Steffi’s shot was right on the money and, within metres, we find her magnificent trophy. I leave her with her ram and watch from afar as she strokes its impeccable, sleek flank and cradles its noble, scarred head. Although I did not know it then, in three months time, out of the blue, I would receive an offer exactly equal to the price we had previously put on the farm before the world financial crisis exploded. This was to be my last hunt on my beloved Bankfontein. The son of the new owner, Tyghe Carstens, has become the new manager of Bankfontein. Not only is he my God son but he is also the first young person I ever taught to hunt on the ranch some 16 years ago. Like Steffi, he also stalked his first springbok on foot and killed the good, representative ram with one shot. A more decent and dedicated young hunter it would be hard to find and, once he has settled into the job, he says he intends to pick up the baton and teach other youngsters to hunt on Bankfontein. He will make an excellent teacher. After all, his own teacher was not that bad, or so I like to think. Mr. Flack, I first read this article shortly after you first posted it, I think. Since then, I have returned to it from time to time, as I have grown older. Many authors can write well, but a very, very few can write with such power that you cannot but be moved by every word. I don’t mean an easy, maudlin sentimentality, but real, authentic emotion where you are there with the writer, sharing the same feelings. This is one of those pieces. As an example of how to approach life changes, I have yet to find better. Good evening, Mr Sykes. I have just read your very kind note and gone back and read the article in question as well. 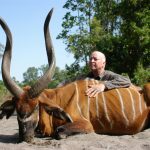 I was very touched by your comments but, since I stopped hunting in February last year after a wonderful Lord Derby’s eland hunt in Cameroon with my son, have not written another hunting story and am not sure I ever will. The stories normally come to me not the other way around and, over the last 17 months or so, I have not been visited by one. That does not mean that I have stopped writing, only that I have written about other things primarily for a local eNewspaper, the Daily Maverick, one of our largest morning newspapers by circulation. Sometimes I write about conservation and hunting in general but also about anything that takes my fancy. To date the newspaper has been kind enough to publish my various mutterings from cricket to law faculties, Theodore Roosevelt, animal rightists and other peoples’ lion hunts and I attach my latest article on Creativity for your perusal.